The research project, Sonic Entanglements: Listening to Modernities in Sound Recordings of Southeast Asia, 1890-1950 will identify, organize, and analyze extant early sound (musical and non-musical) media in and about Southeast Asia during the emergence and development of early recording technologies in the region (1880-1950). The research endeavors to expand the historiographical archival corpus to include the early sound media and technologies as primary sources for the theoretical reflection of the Southeast Asian cultural history of modernities and the region’s entanglement with modern globalization. The project methodologically shifts away from the philological analyses of historical texts, towards developing a framework of knowing how residents of Southeast Asia understood and constituted modernities through hearing and listening. In doing so, the study aims to provide a corrective in the text literacy-based historiography of Southeast Asia modernities which occludes non-literate actors and ‘voices’. 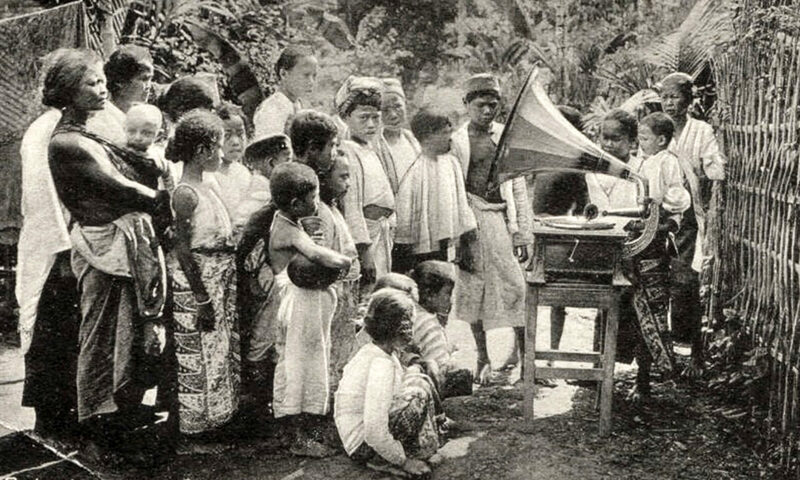 This study on historical sounds of the Southeast Asian region also contributes to expanding the geographical and cultural bases of the sound studies and sound history. The project will examine three themes of modernities in three different case studies: (1) modern racial epistemology and the colonial practices of ethnomusicology, (2) urbanization and ‘noise’ policies, and (3) anti/postcolonial political identities and early radio broadcast. Sonic Entanglements will produce academic publications and a podcast series to make its findings available to the public. Through the support of the Transregional Studies Forum-Berlin, meLê yamomo has recently organized a workshop that brought together sound scholars and sound experts in/about Southeast Asia. Through this workshop, the project envisions to kick-start an inter-institutional research, artistic collaborations, and digital humanities tool. Sonic Entanglements is a research project funded by the Dutch Scientific Research Organization (Nederlands Wetenschappelijk Organisatie – NWO) and is embedded at the Amsterdam School for Cultural Analysis and the Department of Theatre Studies at the University of Amsterdam. Sonic Entanglements will identify, organize, and analyze extant early sound (musical and non-musical) media in and about Southeast Asia (SEA) during the emergence and development of early recording and radio broadcast technologies in the region (1890-1950). The research aims to expand the historiographical archival corpus by including the early sound media and technologies as primary sources for the theoretical reflection of the Southeast Asian cultural history of modernities and the region’s entanglement with modern globalization. Sonic Entanglements aims not just to historicize sound in the region. The project proposes a Southeast Asian cultural historiography based on sound knowledge. In the last two decades, sound studies and sound history have developed into independent disciplines, distinct from the musicological study of euphonic aesthetics, ‘musical’ canons and institutions. Sound scholars have historicized how the western civilization understood the human self through hearing and listening (Burnett 1991; Connor 1997, 2001; Feld 1996; Smith 1973; Smith 2008; Sterne 2003). Sound historians have also studied the sociology of past soundscapes of nature and cities, architectural acoustics, and historical media (Bijsterveld 2012; Corbin 1995; Gouk 2007; Kittler 1999; Smith 1999). Recent interdisciplinary scholarships examine how specific knowledges, as in the fields of medicine, engineering, and physics, are intertwined and inextricable from the sound practices and technologies (e.g. Harris and Van Drie 2006; Kursell 2012; Nicolson, 1993; Tkaczyk 2014, 2015). While aural history advanced significantly, sound historian Mark Smith expressed in 2004 the relative absence of historical work on non-Western sounds. Anthropologist and musicologist Veit Erlmann (2004) also points out the absence of “current debates of Third World scholars interested in auditory perception”. In SEA, steps have been taken towards addressing the need to study sound within the context of artistic ethnography projects(see selected list of artistic projects dedicated to SEA sound ethnography and sound art in the bibliography). The Journal of Sonic Studies Volume 12(2016), published as a special issue entitled “Encounters With Southeast Asia Through Sound”, features urban sound ethnographies of Bangkok, Hanoi, Hong Kong, Jakarta, and Singapore with theoretical reflections on urban studies and identity politics focusing on (meta-)musical objects. Through such efforts, contemporary Southeast Asian soundscape is now being recorded and studied. Bart Barendregt’s (2014a, 2014b) edited volumes and the research project “Articulating Modernities” employs the synecdochic use of ‘sonic modernity’ to investigate popular music in a transnational analyses of cultural modernity in colonial and contemporary Indonesia and the Malay world, and has begun to probe the questions of acoustic history in SEA. Similarly, Philip Yampolsky’s (2013) dissertation studies the musical history of the Dutch Indies through gramophone recordings. The focus of Sonic Entanglements, however is on the history of non-(meta)musical understanding of sounds and the broader implication of sound technology which intends to shift the discourses of modernities from the study of artists, canons, and institutions towards the study of the inconspicuous technologies that set the conditions for the articulations and legibilities of the modern aural experience. Departing from Benedict Anderson’s (1991) notion that the modernization of the world towards the collective imagining of communities as nations was instigated by nineteenth century print capitalism, Sonic Entanglements argues for a sonic analysis of the history of Southeast Asian modernities. This is of particular importance especially if we consider that less than ten percent of the nineteenth-century Southeast Asians are literate to the printed language of modern state-craft, economy, science, and technologies (Ricklefs, et.al. 2010, Nathan 1922). Such print-illiteracy, I argue, has been the bases for argument of the absence of Southeast Asian ‘voices’ in modern cultural historiography. Expanding on Friedrich Kittler’s (1990, 1999) notion that technology frames the possibilities of discourses and its network, this project investigates how Southeast Asian engagement with sound technologies and media was entangled in the global discourses of modernities.